With outcry growing against those who stood by a former Stanford University swimmer who sexually assaulted an unconscious woman, a childhood friend and a high school guidance counselor have apologized for writing letters of support urging leniency for Brock Turner. Defendants can solicit letters of support from family, friends and others for judges to consider before sentencing. One of them came from Kelly Owens, a guidance counselor at Oakwood High School in Dayton, Ohio, where Turner attended. 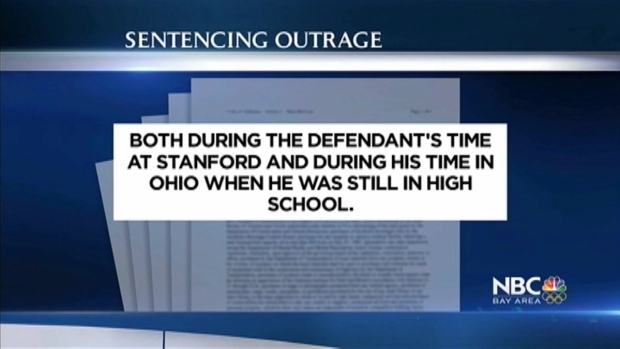 A former Stanford University swimmer whose six-month sentence for sexually assaulting an unconscious woman ignited widespread outrage will leave jail three months early. Bob Redell reports. As Stanford students are finishing the school year, there's no shortage of parties on campus. It's that very culture - of drinking and drug use - that convicted sexual assailant Brock Turner says contributed to his behavior on the night of his crime. Bob Redell reports. Associated Press writers Paul Elias in San Francisco and Ann Sanner in Dayton, Ohio contributed to this story.